Local artist Elisha Ben-Yitzhak has a solo show of paintings opening Saturday, July 9 at the Frank L. Weyenberg Library in Mequon. The Milwaukee area is a bit slow on the uptake considering that Ben-Yitzhak has lived in the city since 1985 and his highly regarded work has been exhibited in prestigious shows such as the Florence Biennale in Florence, Italy, the International Art Exhibit in Ferrara, Italy, the International Biennale in Montreal, Canada and the World Tour of Contemporary Art in London. Ben-Yitzhak was born into beauty although he didn’t devote himself to art until the late ’60s. 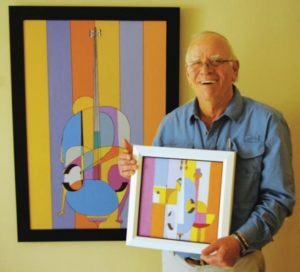 Born in the small farming city of Kibbutz Kfar Blum, Israel, in 1943, Ben-Yitzhak was set on the artist’s path after witnessing the death of a close friend in a tragic hand-grenade accident during military training. Differently described, Ben-Yitzhak’s paintings utilize simple, suggestive shapes and a vivid, but not quite psychedelic, palette of blue, yellow, purple and orange. Ben-Yitzhak lists his central influences as “Wassily Kandinsky, Georges Braque—who I think is greater than Pablo Picasso—and Paul Klee.” The mark of his three influences are apparent in the musical repetitions, harmonious interplay of colors (yielding an almost synesthetic experience) and the Cubistic play with perspective, yet Ben-Yitzhak remains his own distinctive artist. On Saturday, July 9, the Frank L. Weyenberg Library (11345 N. Cedarburg Road, Mequon) will hold a gala reception in its Tolzman Community Room from 3-5:30 p.m., during which there will be an opportunity to meet the artist from 4-5 p.m. For more information, call 262-242-2593 or visit flwlib.org.